ASUS is relentless in its announcements at its press event today. The company has just announced the new Transformer Book Trio, which the company has labeled the world’s first three-in-one notebook, tablet and desktop PC. Featuring two processors (an Intel 4th Gen Core i7 chip and an Intel Atom chip), the Transformer Book Trio also runs both Windows 8 and Android, similar to the Transformer AiO. 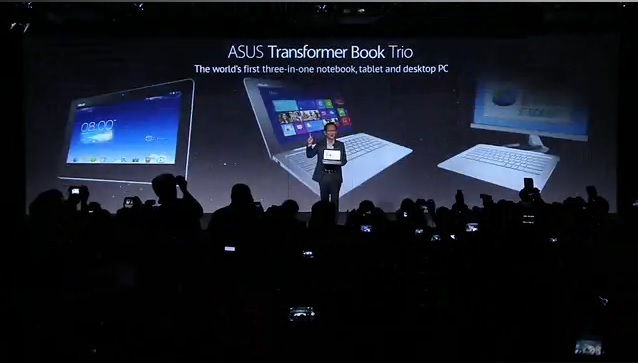 So how does the Transformer Book Trio achieve this three-in-one status? For starters, like other hybrid laptops, the Transformer Book Trio’s display can be detached into an Android tablet. When docked to the PC Station base, the Transformer will run on Windows. What makes this device more interesting is how it has managed to take the idea behind the Transformer AiO, and fit it into a laptop. Now, with the display portion detached, a user can plug a monitor on the PC Station and use the Transformer Book Trio as a desktop PC. As detailed in our earlier feature on how the Transformer AiO works, the Transformer Book Trio looks like it uses the same concept, where the tablet portion works both as an external display for the PC Station running Windows 8 and an Android tablet. A unique syncing system then allows users to sync data when shifting between laptop and tablet modes. To do this, the device actually has two processors at work: a fourth-gen Intel Core i7 processor inside the PC Station and a 2GHz Intel Atom processor inside the tablet portion. Inside the PC Station, there is the Intel Core processor, a 750GB hard drive as well as a 33Wh battery pack. Meanwhile, inside the tablet portion there is an Intel Atom processor, up to 64GB of storage, a 19Wh battery pack and, naturally, a 11.6-inch Full HD IPS display. When docked, the PC Station will also act to charge the battery within the tablet. 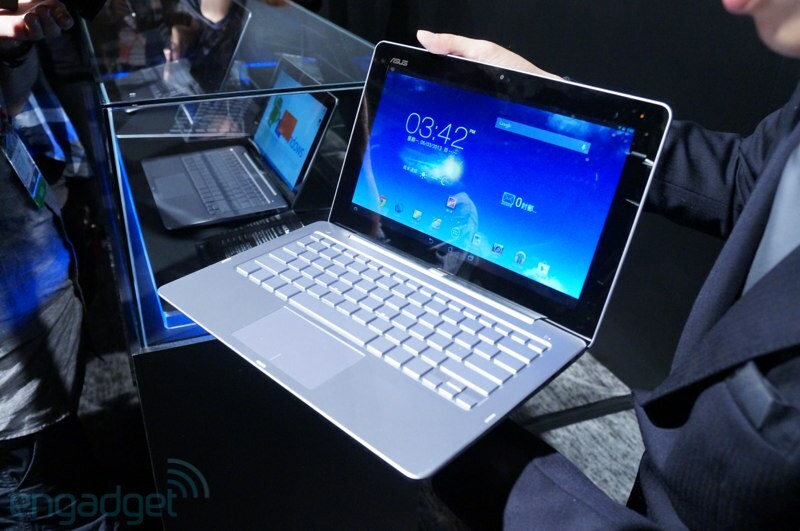 The ASUS Transformer Book Trio, like the VivoPC, is slated for a launch sometime in Q3 this year. Pricing details, however, were not revealed.